So naturally, I wasn't going to leave Korea without any Korean beauty supplies! In fact, we arrived to the airport 2 hrs prior to departure to do some good old fashion duty free shopping. And with 5 girls on a mission, we were taking over all the counter space!!! BB cream (aka Blemish Balm or Beauty Balm) was on top of my list! 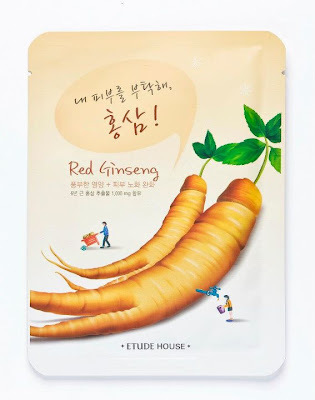 I was going to get the Etude House Precious Mineral since they offer all 4 different shades, which is only available in Korea, but was quickly introduced to the Etude House Age Repair Wrinkle Reduce Royal by my sales rep. She said it's the BEST! Yes, I do like the natural moisturizing, anti-aging and regenerative components with SPF 45, but was concern with only 2 shades to choose from and therefore being too light for my skin tone. 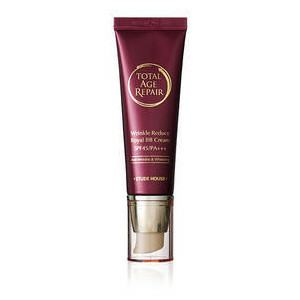 Turns out, after trying every single shades (and being completely covered with 6 different BB cream on my arms), Etude House Age Repair Wrinkle Reduce Royal in #1 Light Beige is the best match. I also got this Red Ginseng face mask since they had a promotion of buy 1 get 1 free. Eh...why not? I can always use more moisturizing anti-aging skin-brightening collagen-plumping mask! thanks for this post! must check the age repair bb cream once my precious mineral runs out (hopefully it's available here in the philippine stores). i hate foundation/base shopping cos i can never tell which shade is right, so i just asked the SA in one of the myeongdong stores which one is right for me and thankfully i don't look like a ghost when i put it on, but sometimes i feel that it is a little too light. i love korea and hopefully you can post more photos!